Food or Faith on Your Daniel Fast? Here is my heart cry: please, keep your Daniel Fast about your faith and NOT about the food! As you look around the Internet and on Amazon for books and information about the Daniel Fast, you will find that most of them focus on the food! People are turning the Daniel Fast into a “Christian seasonal diet” and finding all kinds of ways to continue to feed the flesh while staying within the fasting restrictions. The huge problem with that is when you focus your attention on the food and how to make meals so pleasurable, you miss out on the amazing gifts God wants to give you! Instead of making this powerful experience a time to strengthen your faith and draw nearer to God, you spend your time, energy, and money on finding ways to make meals that give your flesh what it wants. Paul’s teaching about spiritual maturity! And as long as we stay immature, we stay weak and of little faith. We stay like baby Christians. Maturity can only be gained through experience. And the Daniel Fast engages you in powerful experiences with the Lord fostering your growth. The Bible defines fasting as, “restricting food for a spiritual purpose.” Please read those words carefully and let them soak into your consciousness. Let the Spirit call you to this power spiritual discipline so God can reveal to you truths, insights, and blessings. And don’t sabotage yourself by making the Daniel Fast about the food rather than about faith! The Daniel Fast is a partial fast, where some foods are eaten and others are restricted. So we do need to give some attention to what we eat. But keep your meals simple. Don’t spend so much time preparing what some call, “delicious and satisfying Daniel Fast meals.” Delicious to what? Satisfying to what? The flesh! And then you miss out on what the Spirit of God has for you. As you prepare for your Daniel Fast, you have a choice to make. Will your fast be about food? Or will it be about faith? My sincere hope is that you will choose faith. Imagine that you’re at that Y in the road. You have a decision before you. A choice. Will you travel the way of the flesh and focus too much of your energy during the fast on food? Or will you choose the way of the Lord? Will you choose the way of faith? Remember, the choice you make will take you to a destination. Your loving Father has so much for you when you choose to walk in the Spirit. Don’t miss out! His surprises, revelations, and lessons are too good! Know that your Father loves you so very deeply and has so much He wants to give you. Open your heart to Him during your fast. He will feed your better and with more satisfaction than any food can ever do. Susan Gregory has been teaching about the Daniel Fast since 2007 and guided hundreds of thousands of individuals into their successful fasting experience. Her books are the bestsellers about the Daniel Fast and are available at local and online bookstores, including Amazon. Don’t spend so much time preparing what some call, “delicious and satisfying Daniel Fast meals.” Delicious to what? Satisfying to what? The flesh! And then you miss out on what the Spirit of God has for you. This is a good word, Marie. Yes, so many people start the fast unprepared and without the knowledge of how to experience success. My hope is that the work God has called me to do will bless them as they learn and grow. Our Lord loves His children and truly wants us to learn His ways. His ways are the ways that are best for us! I only see where I can reply, how can Inask my own question? No worries. Ask it her and I’ll see it. Greetings and blessings to you Susan for God have given you the insightfulness to help lead his people back to his word through the works that you do. Had to re-read the above paragraphs and you reinforced”food” by referencing Matthew 4/4 thank you for it Is Not about the food but about our spiritual growth. Thank God for you. He is so good and allows me to serve Him in this way. Thanking Him for you right now as I tap out these words. Blessings to you, dear one! Wow! Thank you so much for this revelation, not to focus so much on the food that we miss God’said presence. I needed this encouraging words to help me focus on the word to grow in Faith. This is my 9th annual Daniel Fast and I am always so glad that I set aside 21 days every January. I do use it as a true fast and I prepare for it beginning in December. I re-read Susan’s book every year and I really do learn something new each time. During January I clear my calendar and try to use the time wisely for Bible Study, prayer, rest and quiet. (I am retired so it is easy to do that). I do have health benefits as well for which I am always so thankful. I think of Susan as my “mentor” and I enjoy her e-mail devotionals and encouragement. Our Pastor calls our church to fasting and prayer every January and I am so glad that I have the Daniel Fast in order to participate. If you have not tried the Daniel Fast I would encourage you to do so. Oh, thank you, JoJo for your great words. Our God is so amazing, right? He blesses us in so many ways. And when we fast, we get to step into His mystery that is only accessed by those who believe. Be blessed on your fast. I agree for great things for you! Our God is so lovely as He allows us to meet with Him in this very close way. Go to http://FaithDrivenLife.academy and register for the free Your Journey in Faith Devotional. Oh ok that was last year’s. I thought live in the spirit was the same way for the fast for 2018. Thank you anyways. Blessings your way!!! This is my 3rd time doing the Daniel fast. The first time I did it I accidentally fell into it, I say accidental because I had never heard of this before and I think I had seen a link from another Christian friend of mine, she’s s chef so she would post things on her face book page to do with the food she would prepare or certain foods you can or can’t eat. I didn’t really set myself up for this properly and made it really about the food , The second time o got better I did prepare for the fast I understood more about it and focused onthevdpiritusl dude of it more. Thinking back to when I would see lots of questions which would be about the food which is sad because we myself included could miss so much of Hods blessings and the bigger picture! This is my third and I have and am preparing myself spirituality and I have mor of an understanding of what the fast is about. I have prepared some meals , but I’m not focusing on the smaller picture. I don’t want to just drink milk anymore but I want to eat solids! Iesnt to seek knowledge understanding in Gofd word. Thank you Susan for your words and openness and for sharing your experiences. This will be my 2nd time on the Daniel fast. Looking so forward to yet another wonder full experience. This time I know that this journey will yet be another one worth taking, Thanking you Susan for your guidance on this journey. God Bless. I was so blessed at the last fast. Please sign me up for this fast. Bless you. What are the foods to be eaten daily ? I encourage you to get a copy of the Daniel Fast book so you have all the information you need Daniel Fast Book. It’s on sale right now at Amazon for just $2.99! You’ll find the food lists, recipes, and a daily devotional. Thank you for this wonderful message Susan. I’m so excited about what the Holy Spirit is going to do in our lives. I’m already experiencing some extraordinary things. This will be my second time doing this fast with you. I had so much spiritual growth the first time. I just know God’s going to do exceedingly and abundantly above my greatest expectations this time around. I wanted to find out why is “juicing” not ok for the Daniel Fast? not in recipes but as is- no additives, or sugar- just vegetables and fruits juiced. Hi Susan….That has been on my heart lately too; I’ve been trying to emphasize it is about the faith, getting closer to our Lord, and not the food. I’ve done the fast about 5 or 6 times now, and organized a group New Year’s Daniel Fast. We had 45 from last year; and my prayer is for more this year. Is there a way that each person doing the fast can get your daily devotions/messages rather than me forwarding them, or what do you advise? Thank you for your time and effort! You can copy and past the link to them. Praise God, so many folks are joining the New Year Fast! I just saw this link and it worked! I am in now!! I am so excited to draw closer to God for the new year. I was in a battle since 2011 and in September 2016 God began moving in our situation. No matter how long you have been in your battle, don’t give up. God will answer. Every moment on my knees was worth it!! Every cry to God was heard but I had to wait for His timing. Hang on and never give up! I was spending Thanksgiving week with my daughter and her family. Such a blessing. On that Friday I woke up hearing, “ Daniel Fast Advent”. Up to that point It hadn’t entered my mind. Feeling it was from the Lord, I prepared. And began. I have been doing this Fast once, sometimes twice a year, since 2011. Such a presence with God. Anyway, this last week and why I started this comment was because God shows me that others are in deep need of prayer and I have been able to provide that deeper than I ever possible would have other wise. My pain became less about me and more about helping others. Thank you Susan for your ministry. Be well and God bless. Wow, Marlene, thank you so much for sharing your powerful testimony of faith with us. Our God is so very good. And even in those times of struggle, we can keep our eyes on Him and receive unexplainable (to the world) blessings from Him. This is kingdom living and His peace that surpassed understanding. Blessings to you (and your dear husband). You are tapping into power of heaven on behalf of others. What a gift — and just think of what you can do when you co-labor with God even when you’re flat on your back! I apologize for sounding negative, but I’m having trouble seeing specific “pray requests”, during my fast. This will be my fourth Daniel Fast. I do not focus on food, but the spiritual aspect of faith. In fact, after a week or so, I eating just doesn’t seem that important. This probably is a self answering question. But I have asked to be more successful in my business, to provide more for my wife and family. I understand that the Daniel Fast is not a wish list, but that is difficult to get my mind around. I ask for spiritual guidance and faith, but nothing seems to change, in my specific prayers. I’m not asking you for an answer here, just some thoughts on the subject. Maybe others, have similar concerns…. Looking forward to the Fast in a few weeks…. Good questions and powerful that you’re seeking God for manifestations on heaven by tapping into the power of heaven. That’s great. I do encourage you to get very specific about your requests. For example, “more successful in business” can be “increase my sales by 20 percent in the next quarter.” And then “believe you receive.” Declare the outcome even before it’s manifested in the physical form. That’s part of the spiritual law that Jesus teaches us in Mark 11. Meditate on what Jesus teaches about prayer Mark 11:12-26. Don’t just read it. Meditate. Ponder. Keep meditating until your experience His Spirit revealing the deeper truths to you. I hope this helps. Clearly, you have a desire to go deeper with God. He’s there for you . . . and as you submit more of who you are to Him, the more you will receive His truths. Wayne, my advice to you and everyone else is this.. focus on Christ and others rather than seeking self centered blessings. There is a false teaching alive and well today that teaches us to focus on self, material things, money, etc.. while others sleep under bridges in the cold, eating out of the trash, etc… While some think “that’s their own fault” that’s not always true. We hear a false gospel in the USA that if we give more we will be blessed with big houses, new cars, lots of cash, etc… Try and tell that to families living in grass huts with dirt floors and dying of diseases that have been giving and seeking the Lord for yrs.. explain to them where THEIR $500,000.00 house is. Try telling that to a 20 something year old lady I know of thats got about two months to live and fixing to have to say goodbye to her little kids, family and husband. Try telling it to job. God does NOT bless selfishness, ever. Stop being self centered and seeking selfish things… Seek Jesus and how to be a blessing to others instead. If we die broke, does it matter? Jesus gave us all we could ever ask for but we never seem to have enough. My plan is to purchase both books for many reasons. The first being the spiritual aspect and then food second. I am of the opinion that you have to get the spiritual in order before anything else falls in to place. One can’t be successful w/out the other. My spiritual life is good but can always use some help. I am not perfect by no stretch of the measure. Looking forward to it. Great word, Rebb! Our Lord is so vast and deep. His thoughts are not our thoughts and yet He is willing to teach us whatever we want to know from Him. Be blessed on your fast as you draw nearer to Him. This will be my second year joining you for the Daniel Fast. I’m really excited to see what God will do. I desire more of Him to do His will. Thanks for being a vessel…. Yea! So glad you will be with me on this powerful journey of extended prayer and fasting! Be blessed and expect amazing things! Hello, This is my 1st fast, i became a Vegan 4months ago, so this fast, I dont think will be difficult it was a pleasure reading all the replies…. Blessings to us all on this new journey. Dianne, remember, fasting is not about food. It’s about entering into a highly focused time with the Lord. Yes, we change our eating to put our entire self on alert that the time is different – sanctified. We want to put as little focus on food as possible. As a vegan, you may want to add some restrictions or abstain from television or some other pastime. What I know for sure is that fasting is a powerful time with the Lord and you are in for a supernatural good time. Be blessed, dear one. So glad you will join us! Hello Susan. My church started the Daniel Fast in August and ended in September. My sister, who lives in Texas, completed the fast with me. We absolutely LOVED reading your book each day. We started reading early before the actual fast began. We read one chapter a day. We both said said that the Holy Spirit guided your mind, your heart, your spirit, and your hands as you wrote this book. The scriptures you led us to read and meditate on provided us with so much fulfillment that we could hardly wait to read the next chapter so we started reading one chapter in the morning and another chapter at night. LOL. The workbook was very significant because it caused us to set goals and to review those goals so that we could continue to LOVE our LORD and take care of the temple He has given us. I personally want to say, “Thank you and God bless you for your two books (the Daniel Fast book and the workbook that goes with it”). My sister and I also have your book, ‘The Daniel Fast Book for Weight Loss’. We will begin reading it next week. We are both excited and ready to get on board. There are so many Daniel Fast books on the market, but your book was the only book that focused on our LORD and not just the food. That is where so many other writers of the ‘Daniel Fast books’ have gone in the wrong direction. I noticed their focus was more on feeding the flesh and satisfying the sweet tooth more so than looking at each aspect of our temple (mind, body, & soul) and focusing on the renewing & transforming of our minds. The book you wrote along with its workbook are the #1 books on the market and I, personally, consider them to be in the category of “The Classics”. Thank you so very much for allowing our heavenly Father to use your talent/gift for writing and inspiring others about HIS Word and to teach us how much HE loves us (His children) and wants a day-to-day relationship with HIM. I’m no prophet, but I LOVE the LORD and I am quite sure that your book may have led many people to our Lord & Savior, Jesus Christ. That is exactly what our Lord wants us to do. Learn from Him and spread the Good News. Your book has accomplished both and I, for one, will use it again and again each time I fast. All glory goes to God for providing you as an instrument to write such a divine, thoughtful, meaningful, and thoroughly-detailed book that will stand the test of time throughout the ages. My beloved sister & friend from Texas is a dedicated spiritual warrior and her passion and commitment inspires me to continue reading and learning from your books. She is a beautiful woman with a beautiful spirit and an INTENSE love for our Lord. Like you, she has been a blessing to me and my entire family just as “you” are a blessing to those who thoroughly read, comprehend, and apply what you’ve written in your books. May God bless you and continue to send blessings upon you each and every day as you are and “still is” a blessing to millions of others. I was truly blessed to read the article and also ecstatic to see Hinesville! What ministry are you connected with? I commend your sister and you for the Commitment and Steadfastness with JESUS! 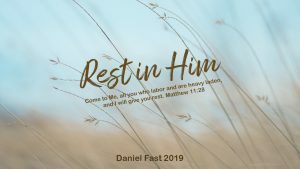 Like so many, this is my first time participating in the Daniel’s Fast. Assumingly, this fast means various things to us all. As for me, I hope to gain better guidance and understanding of a new relationship that is prospering into the possibility of marriage, and to have a closer relationship with Spirit and it’s guidance. I even went as far to refrain from speaking with my love for the next three weeks in attempt to gain even more clarity, and show Spirit how serious I am to receive guidance. I’ve learned this fast is about sacrificing your most pleasurable activities as a method of showing God one’s seriousness to commune with Him. Today, was my first day, and low and behold, my internet with out in my apartment as well. I said to myself, “God, are you speaking to me? Is this your way of demanding my energy be focused on you?” I really wanted to post a message in a Daniel’s Fast community group, so I came to my apartment’s clubhouse for use of their computers. Please keep me in prayer as I will keep you all in prayer as well. Praying for our strength and discipline during the next few weeks. Hi. This is my first time to do a Daniel Fast. I have been reading from different sources about the Daniel fast and I must say the scriptures are so foundational and encouraging. Am believing God for my fiancé’s financial breakthrough , our marriafe , my son’s salvation and wisdom and favour for me and my family . Praise God. Lean on God and count on His promises! This is my 1st time doing the Daniel Fast. Mainly for spiritual growth and physical healing. I need to follow a kidney friendly diet to avoid dialysis , and need to avoid high protein foods, high sodium, and high potassium foods. So some fruits and vegetables need to be restricted. I can’t eat soy either. I noticed that most recipes call for beans, tofu, tomatoes, potatos, etc. , which are high potassium foods. I don’t want to focus this time of fasting just on food, but am having a hard time coming up with what I can eat and what I can’t eat. You have special dietary needs so you may need to slightly alter the fast. Make sure you follow the guidance of your earthly physician as you pray to the Great Physician for complete healing! Hi Susan I have a question, do you find you lose weight, and have you ever done any kind of exercise during? The Daniel Fast is a very healthy way to eat. If you follow the plan like I lay out in the book, you can exercise with no problem. Many people do drop unwanted pounds during the fast. Is it okay to skip meals when doing Daniels Fast? I don’t usually eat breakfast and sometimes skip lunch/dinner. Yes, you can skip meals. However, make sure you take care to not get so hungry that you depart from the fast and fall to the temptations of the flesh. So much of the fast is confronting our flesh and helping us submit more of ourselves to the Lord. It’s a great time of exercising our faith and getting stronger and more commited to our resolve to follow Christ. Thank you, I am learning a lot about Daniel fast that I didn’t know and I want to do it right this time. You are wise to learn about it and prepare. Those are the first steps toward your success! Hi Susan, I usually cut out certain foods For example, no breads, meats, deserts. Try to stick to seafood , fresh fruits and vegetables. Lots and lots of Praying and laying before The Lord! I have the green&white Daniel Fast Book. Is there another one. God Bless you and all who are stepping out on Faith. You will learn so much about the fast for even greater success. This spiritual experience is so amazing! I signed up for teaching on Thursday 21ST. However I will still be at work till 430. Will I be able to view the Webinar later. Thank you. You can have snacks. There really isn’t any restriction on the amount of food you eat. However, you do want to keep in mind that it’s a fast. So overeating is not appropriate during your fast (or anytime, really 🙂 ). First of all, there is a lot of erroneous information “out there” about the Daniel Fast. I’ve been teaching and researching the fast since 2007. All I teach is grounded in the Scriptures, Daniel’s fasting experiences, and typical Jewish fasting principles. There are no sweeteners on the Daniel Fast . . . including honey, cane sugar (which is where sugar comes from), date honey (which is used as a sweeteners even if it’s made from dates), stevia, etc. If it’s a sweetener, it’s not allowed on the fast. Keep your meals simple. Don’t get overwhelmed or get too frustrated about the fast. Have 3 breakfast options. A few lunch options (left overs are great). Five or six dinner options (soup and salad is perfect). And a couple snack choices (nuts, fruit, veggies with hummus). That’s it! Don’t complicate it. Simple and easy. What are the breakfast choices on this fast? Muesli with fresh or dried fruit and unsweetened plant-based milk. Rice cakes with peanut butter, fresh fruit. Berry smoothie made of frozen berries, plant based milk, nuts. All Daniel Fast friendly, have protein, very nutritious. Thank You For Redirecting To the real purpose! It is a privilege to know what to do. The Bible talks about perishing from a lack of knowledge. In this light I am grateful from the bottom of my heart for the followers of the way who keep up the website for people to fellowship, learn and pray. Bless God! God is so good and this is a powerful time of year as we focus on Him and strengthen our faith. I look forward to drawing closer to God through this fast. I pray for the strength to be faithful to all that this fast requires and especially to developing a deeper relationship and faith in God through His word. Help me dear Lord as i seek spiritual enlightenment to endure to the end. So true! Be Blessed in the mighty name of Jesus Christ. Hi Susan…so nice hear your words of wisdom remind us to focus on our faith giving up our food pleasures fasting for Him. I am truly excited about starting this fast. The year 2016 brought so much pain and sorrow to my life, I just want to let go and let God. I usually fast with my best friend; however, she died this year. I praise God for what He is about to do…. Yes, this is so true Danuta. By the way, “fasting” is always about restricting food for a spiritual purpose. Abstaining from TV, Facebook, etc. is and excellent plan and a good exercise to conquer the flesh and to give more time for prayer and study. But it’s not fasting according to the Bible. Be blessed on your fast as you draw nearer to God and His ways. This is so true may the Lord continue to bless you with divine wisdom and favour. I’m so looking forward to doing this again this year!!!! Waiting for God to take me into a deeper walk of faith with Him. I would like to join with you all for the Daniel fast. You can go here: Live in the Spirit and join us! I admire what you do for God’s kingdom. 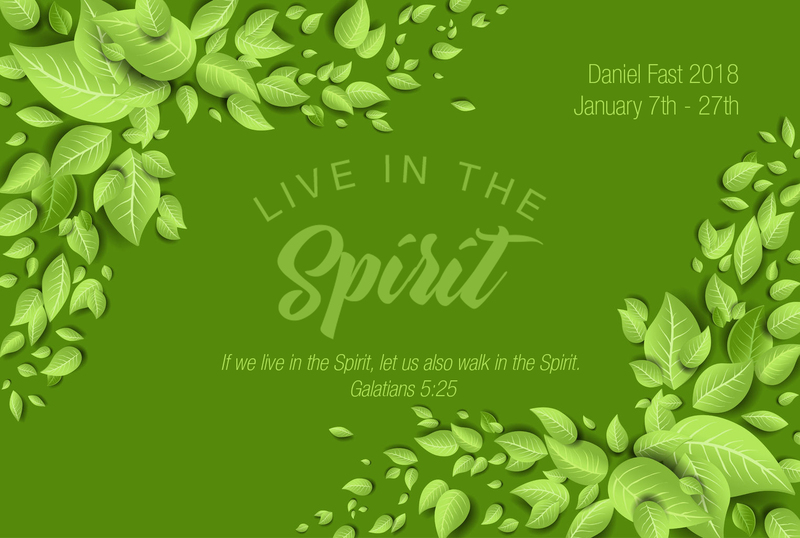 The Daniel Fast seems to be the latest fad for the beginning of each year. I understand the need for fasting. Just wondering why this is particular fast is focused on. I fast from things, activities and habits that waste time and I use that time to pray and seek God more. I find this helps me not make it about food and interestingly enough, eat better. Besides food, would you say the approach and desired outcome the same? The Daniel Fast is a method of fasting, and it’s blessing millions of Christians throughout the world. I think one of the reasons is that it’s a partial fast, where some foods are eaten and others restricted. So more people are able to enter into extended prayer and fasting and still be active in their work and tasks. Certainly, it’s just one way to fast, but it’s very helpful to folks. I hope this helps! It’s amazing to hear how God’s people experience powerful breakthroughs and answered prayer when they fast. Great Vickie! And remember, He leads and we follow. Our following is our submitting to Him and diligently seeking Him and His kingdom. 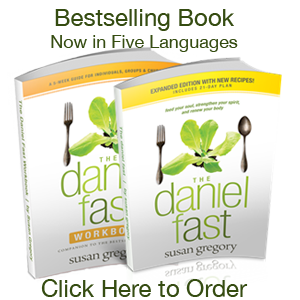 Hello Catherine, to sign up for the Daniel fast, please use this link, http://daniel-fast.com/live/ we appreciate you.